When Bella was born I made a decision that when she would start to eat solids I would make them vs buying her baby food. As parents we want what is best for our children in every aspect of their life. I wanted the control of knowing what was in Bella’s food and by making it myself I would have that knowledge. Now I am not against jar food, I have even fed it to Bella in a pinch BUT did you know that jarred baby food has a shelf life of up to 3 years? Now that certainly gives me motivation to make as much of her food as possible. I mean how fresh can that baby food be after sitting on a shelf that long? – seriously! 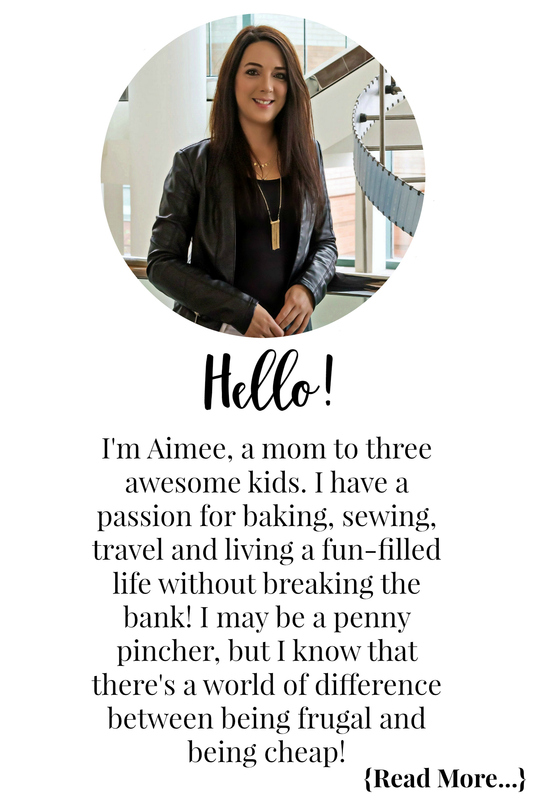 This will be a series of posts so I hope you come back as I will be sharing recipes and more! Today we are going to talk basics, the tools you will need to make homemade baby food for your little one. These are the tools I use here in my home and I found them very helpful in making the process as easy and quick as possible. 1. 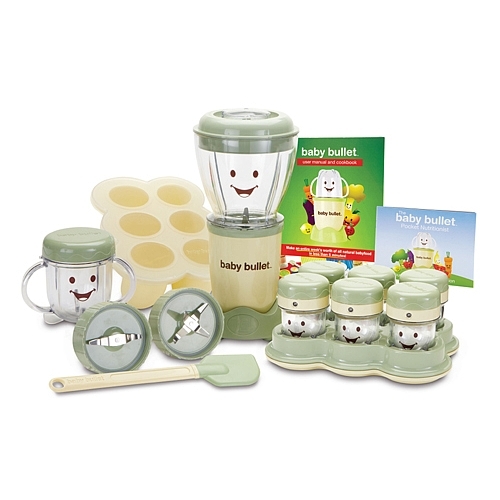 Baby Bullet: this product has made the process of making baby food so easy. The kit comes with everything you see above; a spatula, batchbowl, power base, milling blade, baby blend blade, short cup, user manual, pocket nutritionist, stay-fresh resealable lid, batch tray, 6 date dial storage cups and a tray for them. 2. Baby Cubes: I must say these cubes are so handy! Baby Cubes come in 3 sizes; 40ml, 70ml and 140ml. I use mine to freeze the foods I am making for Bella when I do make large batches so I can store them in freezer safe bags. 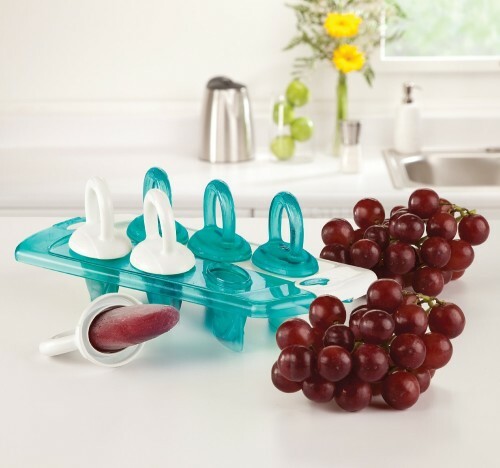 I find I like these more then using just ice cube trays because they have lids so if I am not using them to pop out and throw into freezer bags I can store her food in them in the freezer or fridge. These can be purchased at Babies R Us in 40ml, 70ml and 140ml. 3. 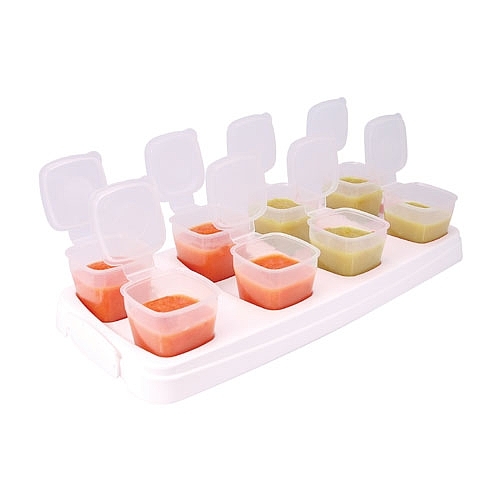 Bowls: I like to use bowls vs feeding from the Baby Cube or Baby Bullet storage cups because babies salivate A LOT and well it’s like when someone double dips in the veggie or chip dip at a party, no thanks! The bowls above are my fave because they come with lids, this means once Bella gets to a snacking age I can put snacks in them for when we are off on adventures. 4. Spoons: of course you would need spoons to feed the wee one with. 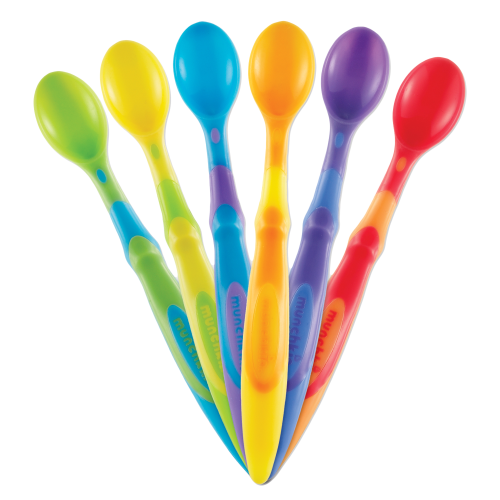 I like these Munchkin spoons, they are bright and fun! I like how they have a soft tip so it is gentle on my little Bella’s mouth. 5. Fresh Food Feeders: I just love these and so does Bella! 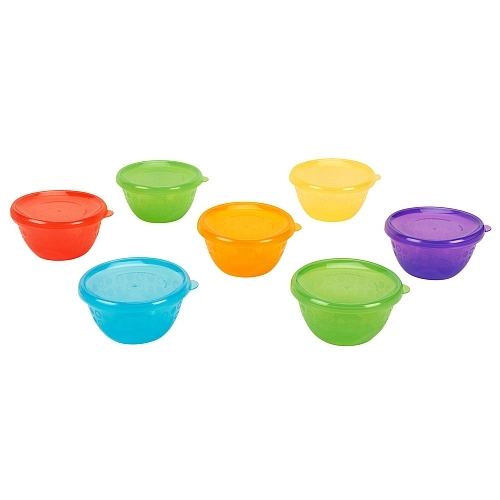 They are great for putting fruits and vegetables in without the worry of choking. When Bella sees me putting in some strawberries into her fresh feeder she starts freaking out! Where were these things when my older girls were babies? 6. Munchkin Fresh Food Freezer Pops: last but certainly not least these fresh food freezer pops by Munchkin are amazing for little hands. With Bella now in that lovely stage of teething making her some delicious and healthy freezer pops to soothe her sore gums has never been easier. I love that they are so easy for her to hold and the perfect size of pop for her too! Stay tuned for Homemade Baby Food Part 2 where I will be sharing starter foods for babies 4-6 months of age! Ava loves her homemade food too! The freezer cubes are invaluable. I need to buy more of the big ones since Ava is such a piggy! A steamer would be a good addition to this list since its the best way to cook the food. I boil her stuff in a pot but only because I don’t have a steamer. I never even thought of a steamer, I guess I just assumed most people would have one 😛 Steaming certainly is best as food loses less nutrients when steaming. Do you have a metal strainer? You could always place a bit of water in a pot, put the metal strainer on top and cover with a lid and steam that way LOL! I wonder if there are other methods out there to steam without a steamer? A big regret of mine was that I never made my son baby food. It’s easy, but I was just “too busy”, I did pay attention to ingredients on the store bought stuff but if I have another one I will be making my own. Great tips and so clever. I know the Bay Bullet is well regarded and a good product for sure. I love the cubes. Awesome tool to keep them eating healthy food. When Little One was starting solids, I also made all of her baby food. I wish I had gotten a Baby Bullet, but for some reason never ended up getting one. I just pureed everything in my Kitchen Aid blender. 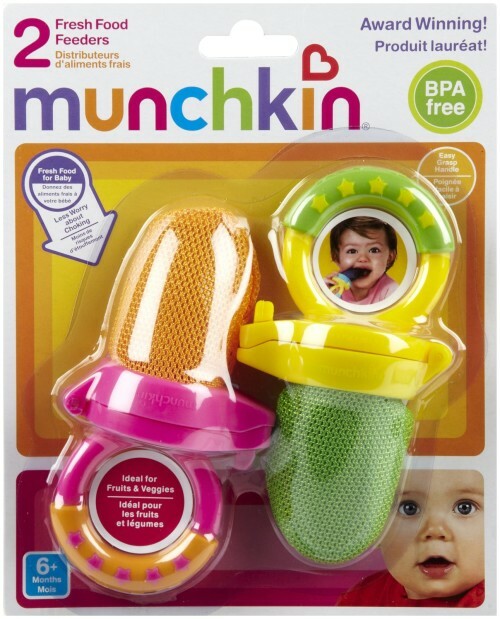 We also loved the Munchkin mesh feeders that you blogged about. Those were awesome. I’ll have to share this post with moms I know who have little ones starting solids and want to make homemade baby food! Great post! My daughter hated my homemade baby food so I was thrilled that my little guy loved the food I made him! 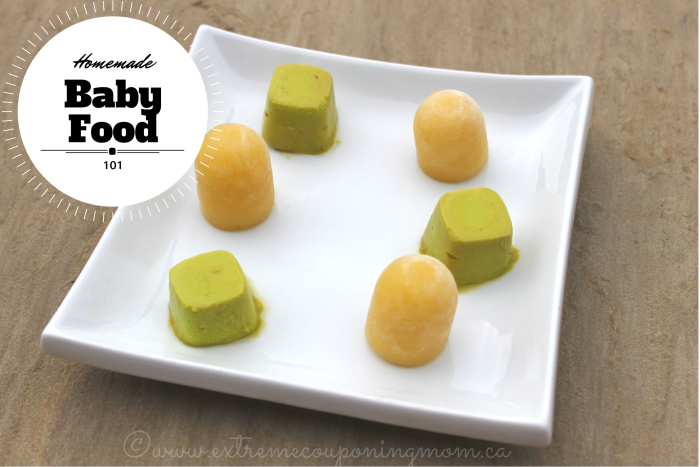 I loved using baby cubes to freeze my purees in. I still use them to store kid snacks on the go as they are the perfect size! Also, the fresh food feeders were great when starting to feed my kids messy foods that were hard to handle like avocado and banana. I have to admit, I was not this talented when my kids were babies. I find that new moms have such great choices in baby products these days. I love the baby bullet. It has everything that you need. Super review.